Does the scientifically based workout that’s sweeping the nation work? Can we just take a minute and talk about how immensely painful and irritating finding a good workout program is? As someone who has been navigating the fitness world for more than three years, I constantly experiment with new routines and workout classes. I’ve done everything from CrossFit to spin classes, but besides strength training, I couldn’t find anything that aligned with my fitness goals. As time went on, I began traveling down the devastating path of plateauing. So what is a girl to do? After hours of copious research, I found Orangetheory Fitness online and immediately signed up for my free first class, and now I’ve been a dedicated member for more than six months. Orangetheory Fitness, founded by Ellen Lathem in 2009, is a one-hour, high intensity interval training (HIIT) group fitness class based on five training zones with the main focus being zones three (green zone), four (orange zone) and five (red zone). The scientific name for this is excess post-exercise oxygen consumption (EPOC), which means your body needs more oxygen at a higher rate than it did before exercise. According to the Orangetheory Fitness website, the after-burn effect results in a 200-400 calorie burn increase for the next 24-36 hours. Basically, 12 minutes in the orange zone equals after-burn, which equals more energy and more calories burned post-workout. So here I am. Testing the theory behind Orangetheory Fitness. I generally go to Orangetheory three to four times a week in conjunction with isolated muscle group training twice a week, and now that I'm six months into the program I can say that I'm really impressed. Yes, I feel more energized. Yes, I have toned up. Yes, my performance has improved. I went from not being able to run a mile without walking, to running 1.44 miles in 12 minutes. I didn’t even think it was possible. Anti-plateau zone. 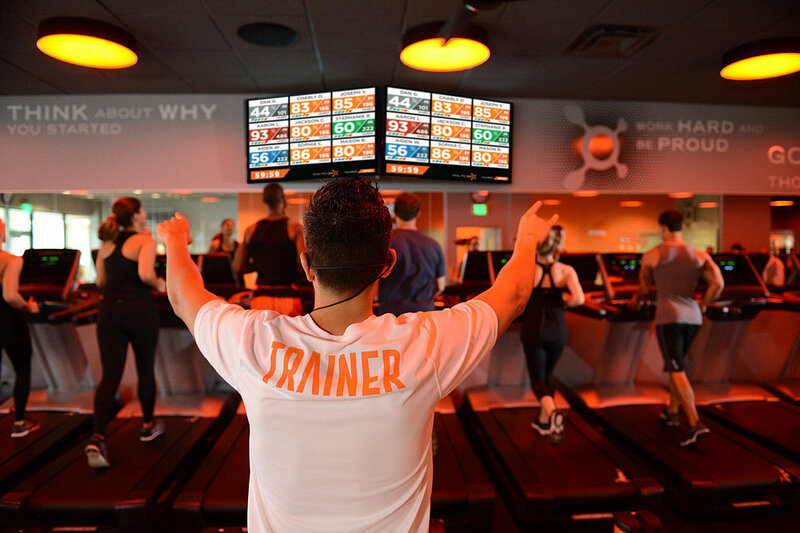 Orangetheory’s class templates are broken down into endurance, strength, power and ESP (a combination of the three) days. The workouts change every single day to prevent plateauing and to avoid overworking specific muscles. Plus, I never get bored! I enjoy a challenge. 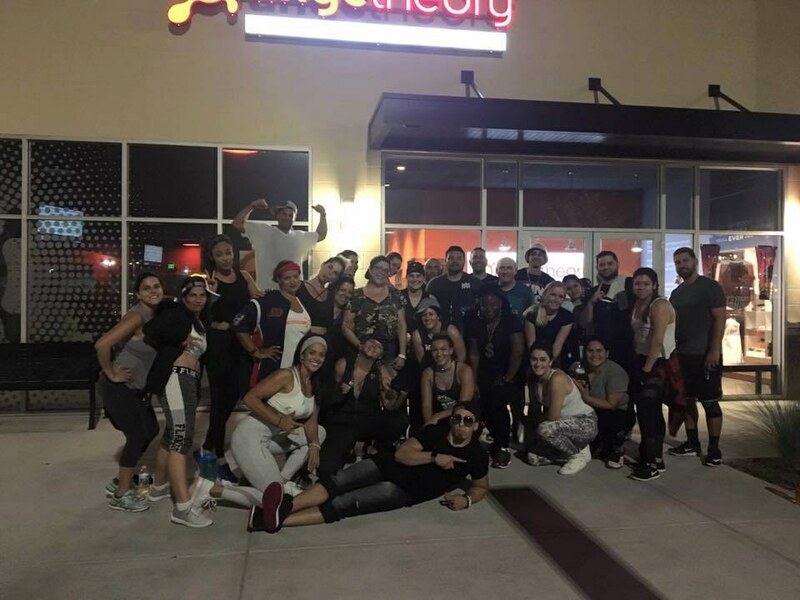 Orangetheory promotes their healthy lifestyle and client improvement through fun challenges throughout the year. Some are weeklong, month-long and sometimes, just a single day, but always have incentives. Dri Tri – Members compete as a team to complete a 5K, a 2,000-meter row and 300 reps of bodyweight exercises in the weight room. Marathon Challenge – over the month of April, members track their distance from each class to ultimately run 26.2 miles. Hell Week – the last weekend of October, Orangetheory Fitness designs horror-themed workouts. If members complete five out of the eight themed classes they get a t-shirt. I get to play dress up. Wait, I get to wear neon sweatbands, scrunchies and leotards to the gym and workout only to ‘80s music? Sign me up. Accountability is key. Partner workouts are tough. But nothing holds me more accountable then when my partner has to row until I’m done with my part of the workout. Sorry. The coaches are motivational. They are quick to correct form and always make safety a priority in the studio. From my very first class when they showed me proper form for the rower, to pushing me to increase my speed on the treadmill, I swear they know my limits better than I do. Group personal training. I love that it doesn’t matter if I’m the last one on the rower because I decided to use heavier weights on the strength exercises. 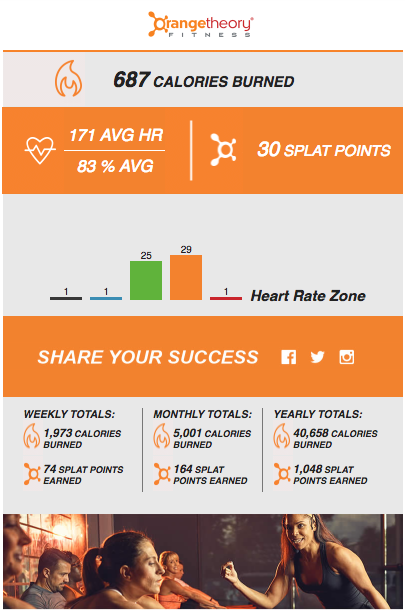 Orangetheory is designed so I constantly compete with myself and my past performance. On the other hand, I thrive off competition; it is a big motivator for me to perform at my highest level. Whether person next to me on the treadmill knows I’m actually trying to keep up with them, I don’t know, but I certainly know that I’m going to do my best to beat their speeds and distance. Traveling doesn’t slow me down. With more than 350 studios in 11 countries, I can find an Orangetheory everywhere. As a member of the Orangetheory family, I have access to every single studio worldwide. Everywhere I’ve traveled since becoming a member had a studio less than fifteen minutes away. The best one-hour workout. I love the combination of cardiovascular and strength training into one class. I have always struggled with finding a structured regime that pushes me to improve my cardio performance, but Orangetheory makes it fast and fun. There’s no half-assing this workout. Due to the heart rate monitoring technology, coaches (among the rest of the class) can see exactly how hard I’m working, and they’re certainly not afraid to call me out. And it is super embarrassing when everyone’s working in the orange zone and I’m not. Show me the numbers. Orangetheory emails me after every workout with stats from the class. My total calorie burn, the total time I spent in the five zones and my average heart rate. It also keeps me updated with weekly, monthly and yearly totals. Nothing shows progress like a bunch of visually appealing numbers. I always joke that I’m “working in my orange zone” no matter what I’m doing. I believe Orangetheory has taught me a lot more than just how to row, but constantly reminds me that my ability to do anything is totally mental. Can I run at 12 miles per hour for 30 seconds? Yes. Is it because I mentally told myself I could do it, or is it because my coach bribed me with a tequila shot? Your guess is as good as mine. Either way, Orangetheory, the supportive members and inspirational coaches helped me reach a personal record I never thought possible. I will forever #KeepBurning.